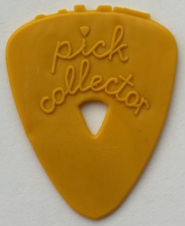 Does what it says on the tin - this is an online record of my pick collection!!! (and hopefully a good reference guide of old and new). My passion is for vintage and unusual picks, but as you can see, I collect all picks! Please be patient if some pages are a bit slow to load - it means there are LOTS of photos of lovely picks on there! UPDATE: APRIL 2017 - I finally have a new laptop, so will be able to catch up with the backlog of picks I have to go on here! A little bit of Pickology! Apart from the aesthetic or historical side, all guitar players should read this about choosing a pick! Like most people, I tend to find one pick I like, stick with it and don't really think about changing it. Often for years at a time. Most of our local guitar shops stock a small selection of basic picks so there just isn't the opportunity to try different picks out. So you stick with one type, right? I mean, you spend hundreds on choosing a nice guitar, an amp that's bigger than you'll ever need, enough special effects to keep your feet dancing all over the place.......then you fork out 50p or 50c on a basic pick!!!! 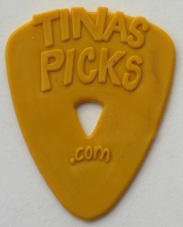 Most guitar players don't realise how much difference the pick can make to your sound and your playing. I'm not trying to endorse one particular pick as it is such an individual choice. What I'm saying is set aside a tenner ($15) and splash out on a variety of shapes & materials to experiment with. If your local shop doesn't do a range, then get them on the internet. I used Jim Dunlop nylons for years (like half the population! ), then cheap heart shape picks (because they were red, & a nice novelty shape! ), and I stuck to them for years. Then discovered that I loved the sound of Fred Kelly polycarbonates and realised what a difference the material can make to the sound. I had always used a medium or .73mm pick too, preferring a bit of flex, but then I tried the solid acrylic Raptors. They have given me more attack and variety to my playing. I have alo discovered TUSQ man made ivory picks - hard as nails but thin as a normal pick and a really lovely tonal quality. I have stuck with these for a few years now, but every now and again, I'll play with something different and it usually alters my playing! (Having said that, I have just received the latest TUSQs and they are different from the original ones I had, so I am going to have an experiment with them to see if they're as good). It's all about experimenting and developing, and recognising that you may have handwound pickups, NASA endorsed strings, vintage valves and audiophile-grade angel hair leads, but if you don't chose your pick carefully, you won't get the best sound! Certainly don't chose it just because it has a colourful cartoon character on it!!!!! Check out my new Les Paul handmade pick given to me by the Mahwah Museum Society, New Jersey!!! (Les Paul lived in Mahwah from 1952-2009 when he died). The pick is under the 'Vintage' section. For quite a while I have been wanting to commission my own pick and here it finally is! I have some new plans for the website! If you'd like to be first to hear about them, enter your email below. This isn't going to be a regular mailing list - just the occasional email. No spam! You won't be emailed every time a pick is added to my collection! Your details will be used for my website ONLY and WILL NOT be passed on to anybody else.